VOTE IS IN… OUTSTANDING NYC WEBSITE! I’m honored and humbled (by the way, why do people say “I’m humbled” when they win an award? About twenty years ago, I was truly humbled at a bus stop at Nostrand Avenue and Avenue R when a miscreant winged an apple out of a moving bus window and it hit me in the coconut) because Forgotten New York is the first-ever recipient of Outstanding New York City Website by the Guides Association of New York City. FNY has been associated with GANYC since 2012. The Guides Association of New York City is New York’s only organization representing licensed, professional New York City Sightseeing Tourist Guides. It’s also one of America’s oldest guides associations. The awards ceremony, at a packed Leonard Nimoy Thalia Theatre at Symphony Space, Broadway and 95th Street, March 2, 2015, attracted the cream of NYC-based websites, authors, tourguides, historians, restaurateurs, and many others who contribute to NYC’s status as the world capital of tourism. 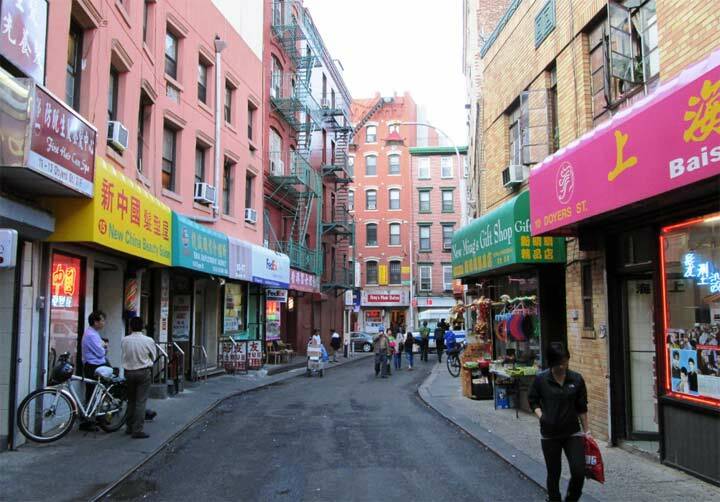 Among other winners were the Bowery Boys podcast and longtime New York Times Streetscapes columnist Christopher Gray. The first recent photographs of the webmaster, flapping jowls and all, were occasioned at the ceremony. My guest was my dear friend and fellow Greater Astoria Historical Society board member, DeeAnne Gorman, a renowned singer in her spare time. Congratulations….all your hard work has always been realized by your faithful readers, but now a professional organization recognizes and honors you for it. Many thanks for all your posts….I look forward to each one (and I am particularly fond of any post that is Staten Island related). I just don’t know how you do it….and so well. Congratulations and thank you for the many many hours of enjoyment you gave me. What a wonderful evening it must have been … much deserved. 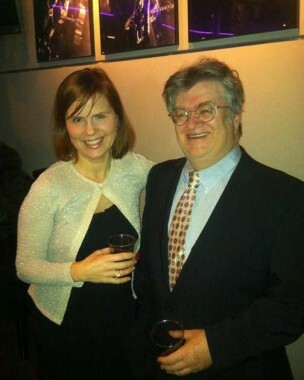 You looked VERY nice in your new suit … and DeeAnne stunning. Kudos to YOUdos. (Hmmm … you got bopped on the coconut with an apple, eh? Someone stole MY idea! Heh-heh. How perfect that FNY was awarded at the Leonard Nimoy Theatre: LLAP! How about a special Victory Tour? Congratulations! Love this site and pass on the address to every New York person I know. Many congratulations, Kevin! You deserve this recognition — and much more! Congrats on your “Oscar” win! You do a great job! Great! Congratulations to the only writer in NYC that gives equal time to my native borough of Staten Island. Your site is much appreciated. Well deserved! You do a great job of promoting the city and honoring its past. You will be happy to know my week doesn’t start until I click on FNY. Congratulations. I’ve been visiting your site since 2000. Always a pleasure to do so. It’s an honor to know you, & was an honor to be there to witness the BIG win in person – BRAVO! Here’s to a great upcoming FNY season of tours & presentations! Who is that in the picture? Your daughter? Phooey…it’s one of the outstanding websites period, not just NYC. I check in on this site often, and it doesn’t disappoint. And I’m not even from NYC. It’s very well done, informative, and entertaining. Congrats. Hurrah, my hero gets well-deserved recognition! Congratulations, Kevin. No need to be humble about being the best at what you do. You devote a lot of time and effort to make Forgotten New York the most informative and entertaining website, bar none. All your GREAT work deserves many Awards !!! i wanna contribute dough to fny but cant cuz everything is done by computer these days-no street address to send money to,not even a PO Box,I aint sayin Im gonna make an endowment to the arts-just around $40-that might buy a few subway fares or whatnot to FNY upkeep…. Congrats on the award. Your website is the greatest and as all your devoted readers will agree in that they look forward to your next posting. At one time in the past you mentioned that you were thinking of doing something about bowling alleys from the past. As an ex Brooklynite I would look forward to read about Paradise Lanes, Leemark Lanes, Prospect hall Lanes, Regal Lanes and Frankie and Johnny’s to name a few. Keep up the excellent work on the site and again Congratulations Kevin . I’m glad to hear that you won Kevin, and I know that you deserved that award. Congratulations!!!! I’ve been coming to FNY for years and it’s always been great! Heartfelt congratulations to Kevin Walsh from Denver, Colorado. Your site keeps my NYC hometown alive in my heart. Thanks for all you do. Your hard work shows in FNY; it is both a quality website and a class act. 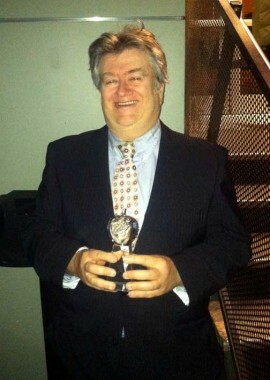 WOW – My two favorite NYC sites, Forgotten NY and Bowery Boys bring home the gold. NYC history buff everywhere are elated by these acknowledgements. Glad to see you receiving the acclaim you so royally deserve! Congratulations from your Seattle contingent! The award makes official what many of us have known for years…that you are the best in the business! Hearty congratulations on a well-deserved award, Kevin. As an old Flatbush, Woodside and Flushing creature I enjoy this site immensely. Way to go Irish! So well deserved, congrats Kevin! Thanks to your devoted efforts I’ve learned much about NYC history, and enjoyed doing so. Congratulations Kevin. FNY has been a great site for some time. Keep up the good work. Congrats, Kevin. All the boys down here at the street sign department are proud of you. Keep up the good work. I offer my congratultionas as well!! Bravo!!! For 20 (right?) years your website has simply been unequaled in quality. Quality of it’s selection of pictures, text and layout – Quality of its conten! Content that is only the best! Well written text that shares your research (and enthusiasm) with all of us who follow your site! Pictures that put you “right there” from one end of a neighborhood to the other, and pictures that traverse extensive journeys along many signficant avenues and streets, and pictures that always capture the details, of a forgotten or unseen New York, apartment buildings, unusual signs, details that illustrate what makes every corner, road and alley of New York utterly unique and exciting. And you have brought this all to us, your readers. If Forgotten New York never existed, it would have to be invented….. and guess what, you invented it!!!!! Thank you so much for this wonderful piece of work – a true gallery of our city. Congratulations, Kevin! Your website brings a smile to many – especially those who live and work in this great city. Thank you, sir. My congratulations to you Kevin. What would the Big Apple be without your web site ? I shudder to think. Keep up the good work. Kevin, it’s good to see you getting this well-deserved recognition. And thanks, as I’ve said many times before, for keeping me in touch with my old neighborhoods in Staten Island and my NYC hometown. Congratulation- your site is consistently remarkable. Hope it continues! Kevin: this award has been a long time coming! I have been visiting FNY for years now, and you certainly deserve it! The amount of time, the lengths of travel involved, and many other aspects of FNY show how hard you work at this. All of your posts are derived from actual experience in the field, so to speak. I cannot begin to tell you how much I have learned over the years…. and, just when I thought I knew it all, you showed me when I was wrong, and educated me in ways too numerous to count. CONGRATULATIONS!, and I am looking forward to many more years of your knowledge, expertise, and wit…. I’ve been a loyal reader for about 15 years now and I love what you have brought to the table. Congratulations and many more years of interesting posts. Well deserved congratulations from a relocated Queens boy. Congratulations! You’re the best in a great group! I solved the Big Apple and I wasn’t even nominated! Well earned recognition. You have worked long and hard at this blog. Your dedication deserves even greater recognition. This has been my favorite website for a long time now. I look forward to enjoying it for a long time. The honor is well-deserved and hard-earned. This is one of my favorite websites in the world. Congratulations, and may it continue forever. Congratulations on a well deserved award, Kevin! Good on ya! I have been loving this site since you started it, and though I no longer live in NYC, I still look at it most weeks and I still love it. I know I’m way late to the party, but I’ve been a fan for at least 15 years and still check it every day. Congrats on the award, it should’ve happened sooner. Wish I still lived close enough to participate in the walking tours. Congratulations Kevin! You made New York City history interesting long before it became fashionable. Here’s to many more years of FNY, one of the best sites dedicated to preserving the history of New York City. Congratulations! Well Done!! And Thank you for making the site a daily stop for me!!! FNY makes New York City history very interesting and a pleasure to read. It is a much deserved award and you earned it. Hopefully this will mean much bigger and greater things ahead for FNY. Having grown up on Staten Island in the 1950’s and 1960’s before moving away, I’m always happy to see your photos of the old streets and buildings. Congratulations, Kevin. I’ve been a regular reader for a long time. I always look forward to reading FNY. I grew up in South Ozone Park, and went to Bishop Loughlin HS in Brooklyn (on the A train). I live in NJ now but I’ve lived in 4 of the 5 NYC boroughs (haven’t lived in the Bronx) and I remember many of the places you write about and photograph. One of many greatest ways to search for details would be to research online.